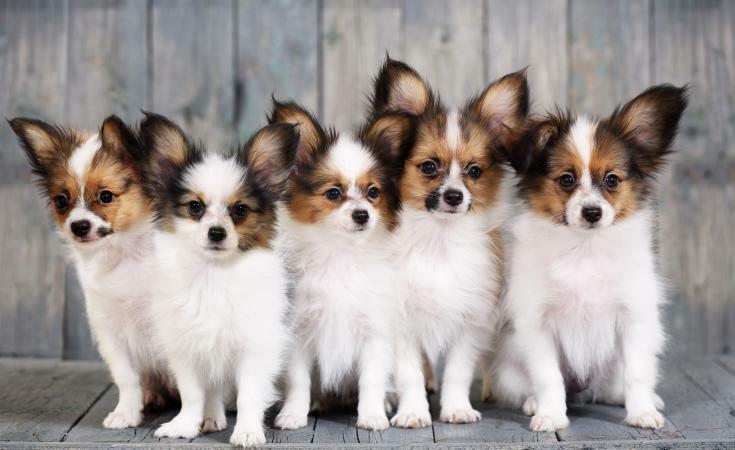 The Papillon dog is an old and well-loved breed. The name Papillon, which means "butterfly" in French, comes from the distinctive, fluffy ears of the breed. This diminutive dog has a big heart and makes a great companion. The Papillon dates back centuries in Europe. It traces its heritage to the Continental Toy Spaniel and was once called the Dwarf Spaniel. Long popular with royalty and nobility, the Papillon dog appears in numerous works of art. The Renaissance painter, Titian, painted the dog frequently. The breed also appears in a portrait of the French King Louis XIV and his family. The original dog had drop ears, as shown in the many art masterpieces. It wasn't until the 18th and 19th centuries that the erect ears emerged. The drop-eared version became known as Phalene, meaning "night moth." In Europe, the two versions are considered separate breeds. In the United States, the American Kennel Club (AKC) recognizes both versions as the same breed. The Papillon was recognized by the AKC as a breed in 1935. In 1999, a Papillon dog was first awarded "Best in Show" at the prestigious Westminster Dog Show. The "Butterfly Dog" is a small breed that stands between eight and 11 inches at the shoulder. It is light and fine-boned, and weighs less than an adult cat. It has the rounded head of a spaniel, as well as warm, brown eyes. Its tail should arch over its back in a feathery plume. A Papillon coat should be silky and abundant. The coat lacks an undercoat, and this makes it easier to maintain. There should be a ruffle of hair at the chest and feathering on the back legs. The coat should be parti-colored, meaning white with another color. All white coats or coats with no white are considered a fault. Most distinctive about the Papillon dog is, of course, the ears. Whether dropped or erect, the ears should be large, rounded and set on the side and back of the head. Erect ears should move like the wings of a butterfly; the drop type should lie flat. The Papillon is an energetic and intelligent dog. Despite its small size, it is agile and needs regular exercise. Many "Paps" compete successfully in agility competitions. A loving companion, the Papillon has been bred to be a lapdog, so it is never happier than when it's near its owner. It makes an excellent apartment dweller. The Papillon is easily trained, obedient and alert, but it does have a tendency to bark quite a bit. In general, this dog is healthy and long-lived with a life expectancy of 13 to 16 years. The dog may have a few issues with its eyes, such as Progressive Retinal Atrophy (PRA), an inherited eye condition. Papillons may also experience a luxating patella, or dislocated kneecap. As with most small dogs, dental hygiene is important to prevent gum disease and tooth decay. Papillons may be more vulnerable to anesthesia. Be sure and talk to your vet regarding anesthesia before any surgery. A Papillon dog makes a great family member, but it's not a particularly good fit for families with small children. The dog is usually good with children, but it can be injured in rough-housing. The Pap benefits greatly from early training. As one of the smartest breeds, this dog will learn quickly. The breed is alert and protective. While its diminutive size may not make it a particularly effective guard dog, it will bark at perceived threats to its domain. This may cause some problems in apartment settings. Like other Toy breeds, the Papillon may have some house-breaking issues. Patience and consistency will usually help this smart canine learn the lesson. This beautiful breed has a long history of being a human companion. Generally healthy and energetic, it adores being with its human. Its intelligence and personality make it a great choice as a new family member.